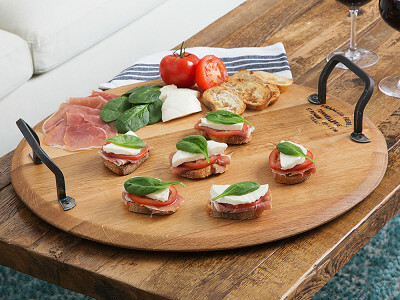 Every one of these reclaimed, wood platters has a story to tell. 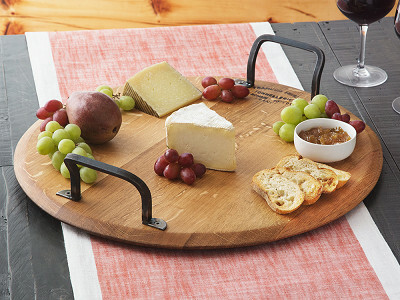 They’re made from retired American and French oak wine barrels. After careful dismantling, the barrel heads are refinished as the foundation for each platter—retaining its original charm right down to the original cooper’s mark. 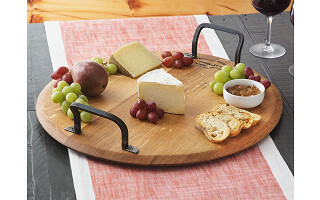 Every Provence Platter is handcrafted, resulting in unique markings, wood grains, and textures. For added functionality, the refinished cask heads are paired with hand-wrought iron handles making these serving pieces as durable as they are beautiful. Traditionally, an oak barrel only imparts its woody flavor in wine for four years. Designer Ivan Hull, a wine enthusiast, sought to breathe a second life into these aged casks. 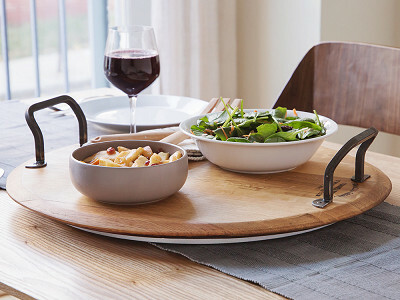 Available in traditional or Lazy Susan versions, these platters are perfect for entertaining, as a functional decor piece, or for high-end gift giving.